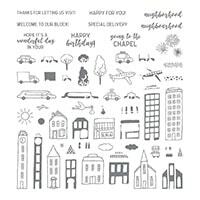 Hello and welcome to For the Love of Creating with Stampin’ Up! 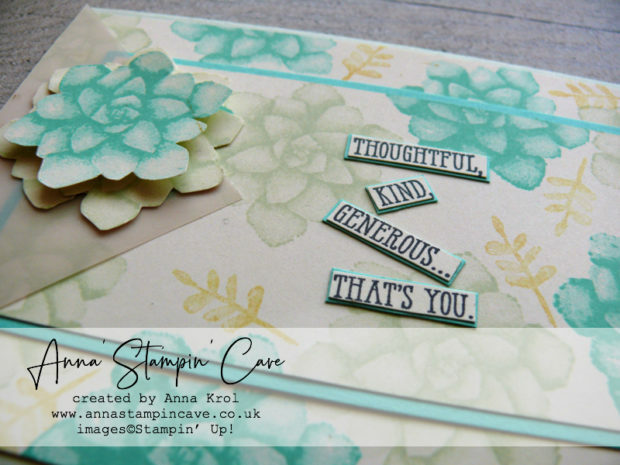 Blog Hop run by the amazing Australian demonstrator, Kim Oliver. 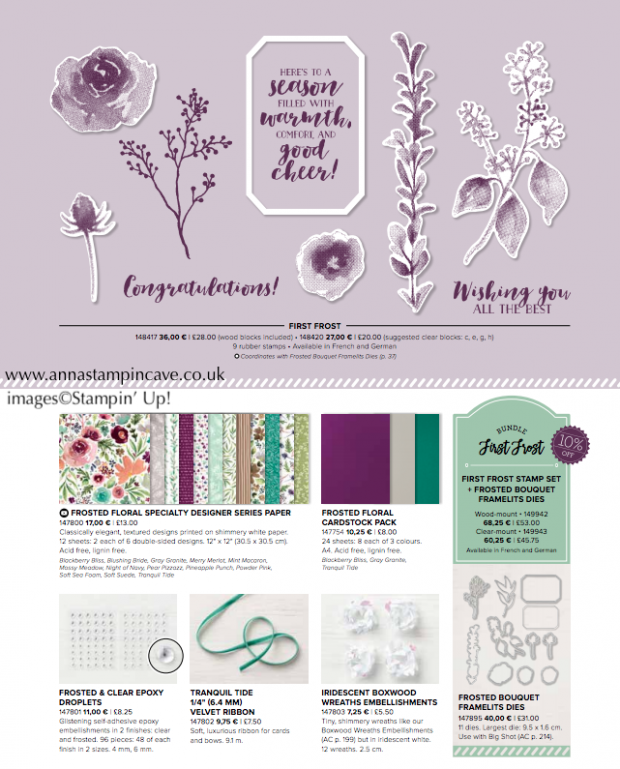 We are super excited to share with you an array of creations showcasing a sneak peek products from 2018 Holiday (Autumn-Winter in the UK) Catalogue. 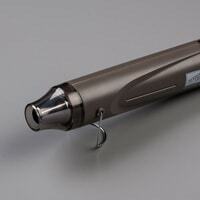 We hope you find great inspiration from our projects. 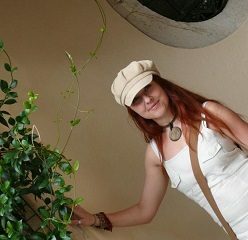 If you have arrived here from Sandra Mastello, a big welcome to you. You are currently visiting Anna Krol from the United Kingdom. 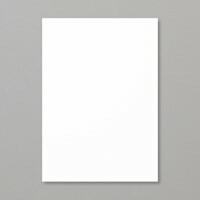 For my projects today I decided to showcase a beautiful suite of products called Frosted Floral Suite. 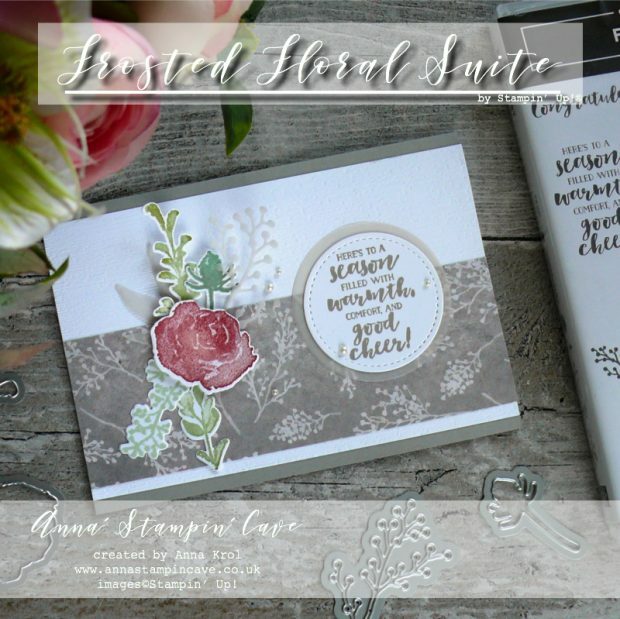 I did not order the whole suite yet, but enough to showcase a beautiful stamp set with coordinating dies, and unique Designer Series Paper. First, I created my card base. 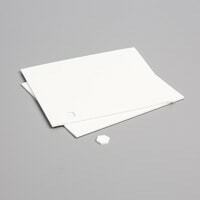 Next, I run my Whisper White panel through the Big Shot using Subtle Dynamic Textured Impressions Embossing Folder. 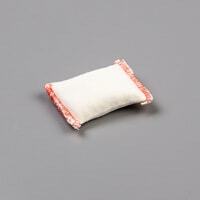 I love this really subtle linen-like texture. I adhered it to the card base. 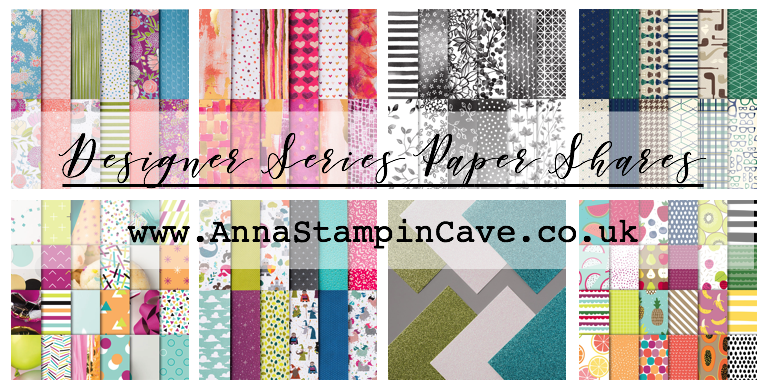 I’m totally in love with this amazing paper. 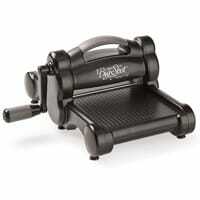 It’s oh-so-beautiful! Not only because of stunning, handpainted designs. 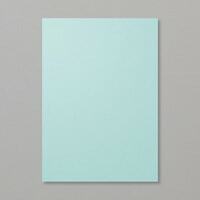 This paper is so yummy and full of shine, like if it was printed on Shimmery White cardstock. What’s more, a girl can wish for? I picked a neutral Gray Granite design and cut 2″ strip and glued it into the bottom half of my card base. 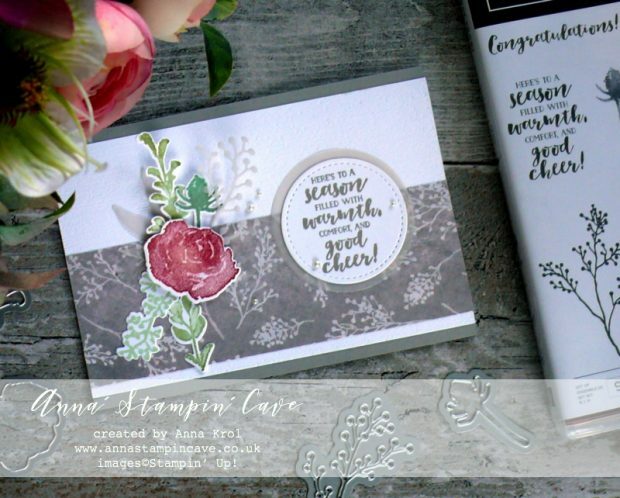 Just as a breathtaking is designer paper, a First Frost Stamp Set and coordinating Frosted Bouquet Framelits Dies are equally beautiful. 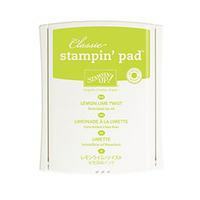 I’ve used Stamparatus to stamp my images onto Whisper White cardstock, and die-cut them with matching dies. I also die-cut a few images from vellum. I played with arranging my die-cuts to decide how I wanted them to go on the card and I snap a photo for a reference. 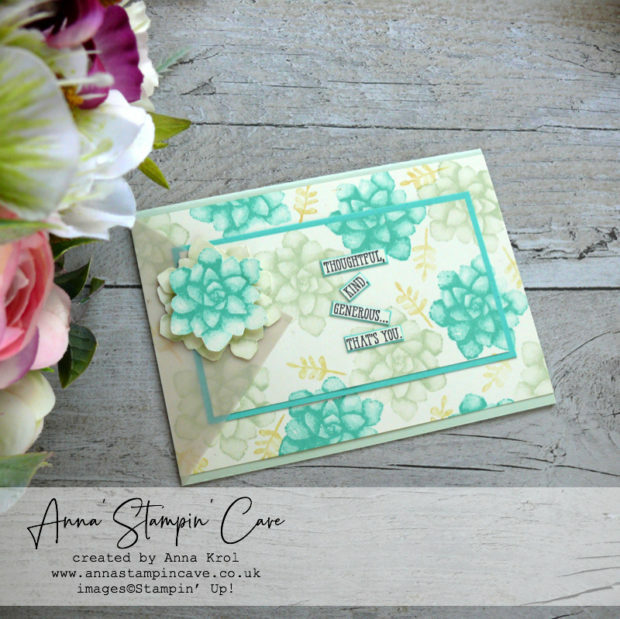 Using either liquid glue, snail adhesive or dimensionals – I added all my pieces to the card. I die-cut a circle using second smallest circle from Stitched Shapes Framelits Dies and stamped my sentiment using Gray Granite ink. 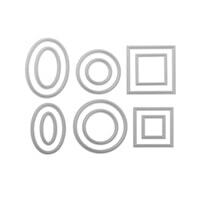 I also die-cut a slightly bigger vellum circle cut using Layered Circles Framelits Dies (approx 2-1/8″ – 5.4 cm). I adhered them together and mount it onto my card. Few Basic Pearls finish off my card. 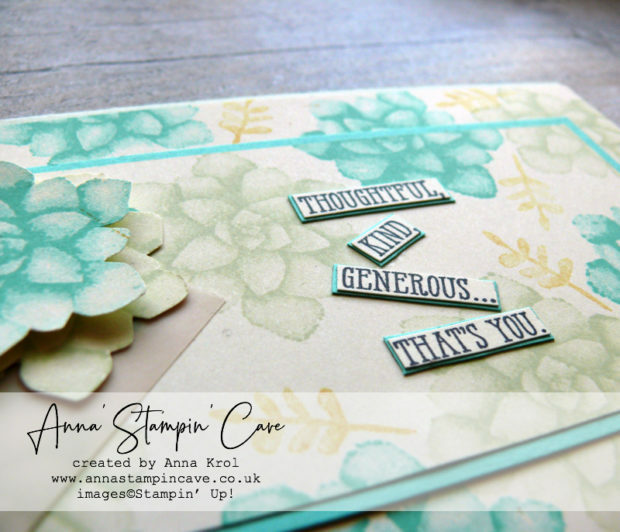 I hope you enjoyed coming to my blog today and now, be sure to hop along and see more inspiring projects. Hello everyone. 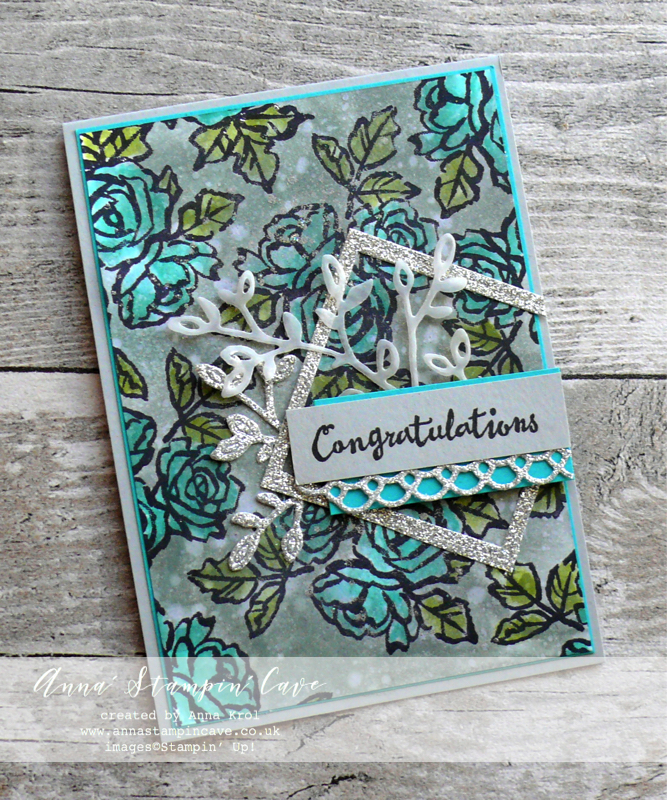 Today I’ve got for you another card from the bedazzled series. You can see previous cards here and here. 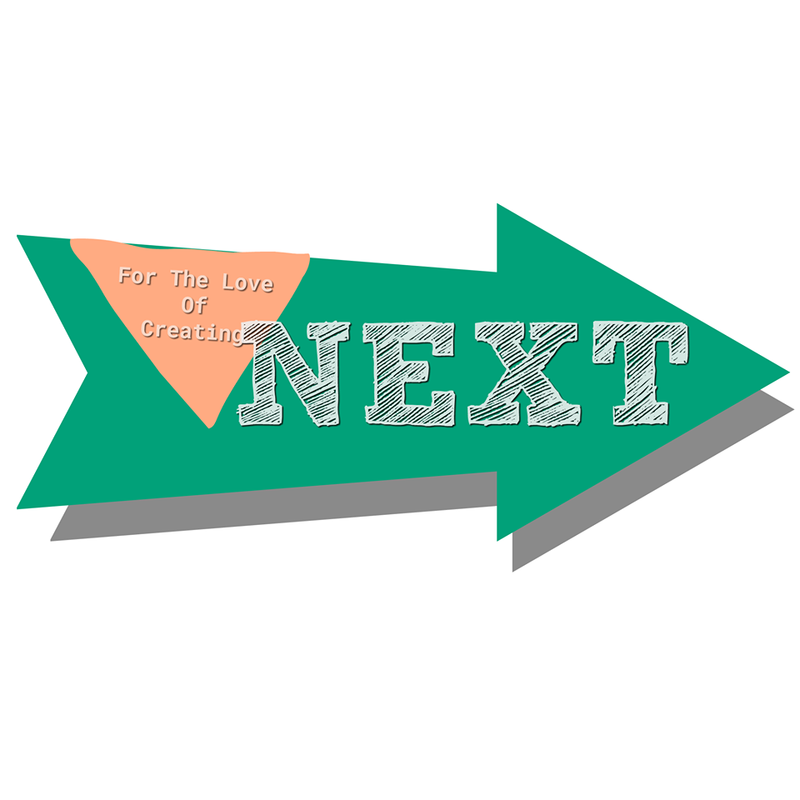 I’m not a girly girl, I’m not crazy about pink or bling or glitter and all that jazz, but I came up with this idea accidentally (you can read about it here) and completely fell in love. First, I created my watercolour background. 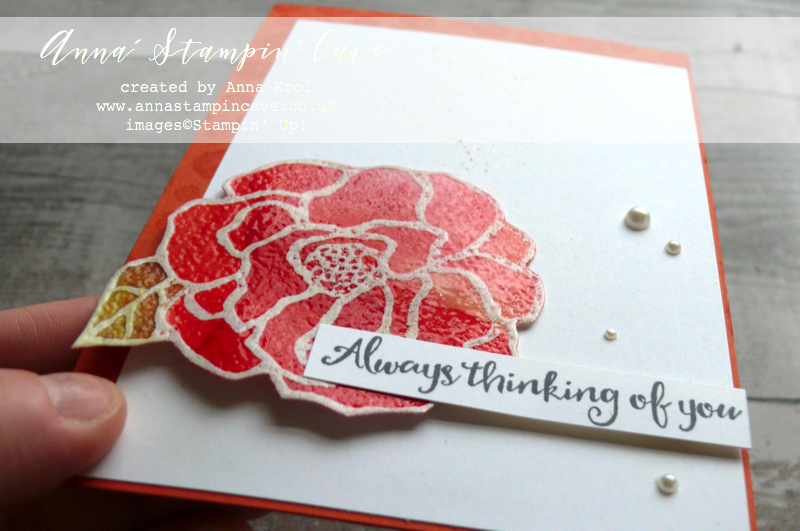 I stamped roses from Petal Palette Stamp Set in Basic Black Archival ink, which is perfect to work with watercolours. I’ve used Bermuda Bay Ink Pad to colour in all my flowers. 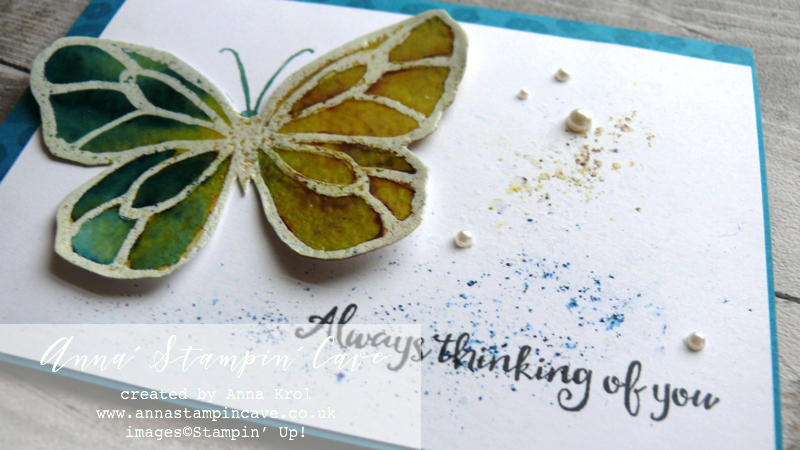 For leaves, I’ve used Old Olive with a hint of Lemon Lime Twist Ink Pad. Next, I sponged the whole panel using Smoky Slate Ink Pad and Stamping Sponge. My favourite technique with a sponged background is to flick water all over it and let ink to react with water to create a distressed look. 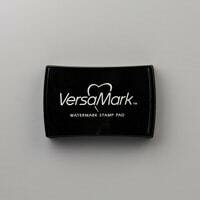 I’ve used Embossing Buddy, antistatic pouch, to remove the static or any oil from the panel, flicked some more water on the background, sprinkled with Silver Emboss Powder and heat set it. 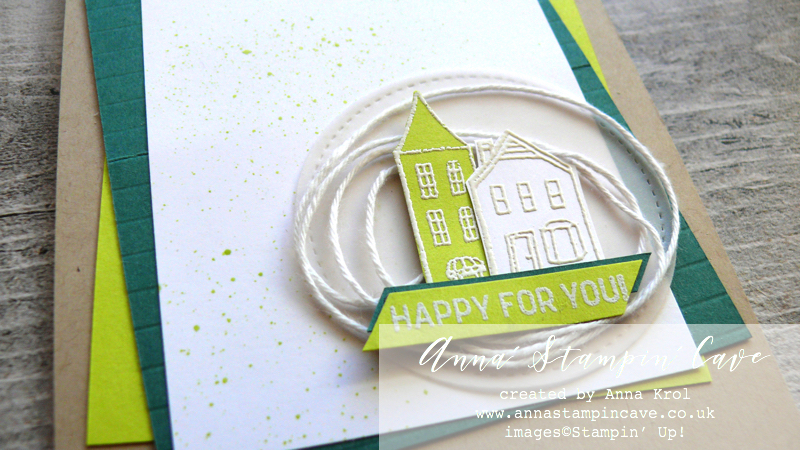 Added more sprinkles/embossing until happy. 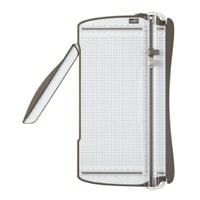 I reheat my embossing on the panel, cover it with Dazzling Diamonds Glitter, tap off the excess and heat set it again. Don’t you just love these ‘dazzling’ speckles?! 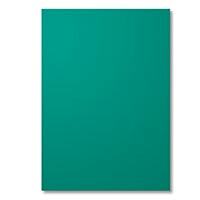 I adhered my background panel to Bermuda Bay mat and next to Smoky Slate card base. Now to jazz it up a little. 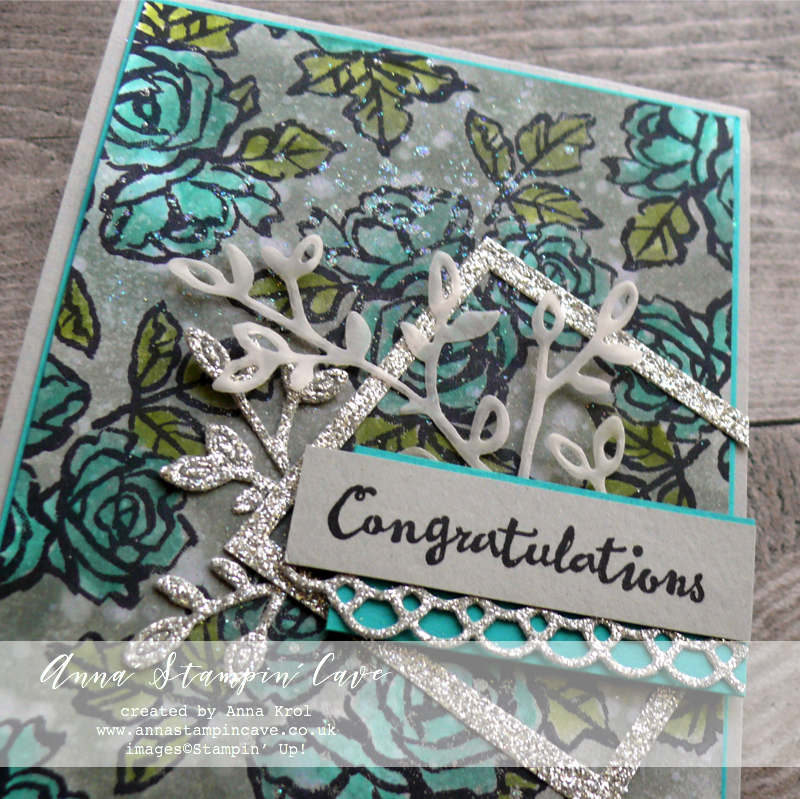 I’ve used Petals & More Thinlits Dies to die cut few elements for my card. I die cut two branches: one from vellum and one from Silver Glimmer Paper. 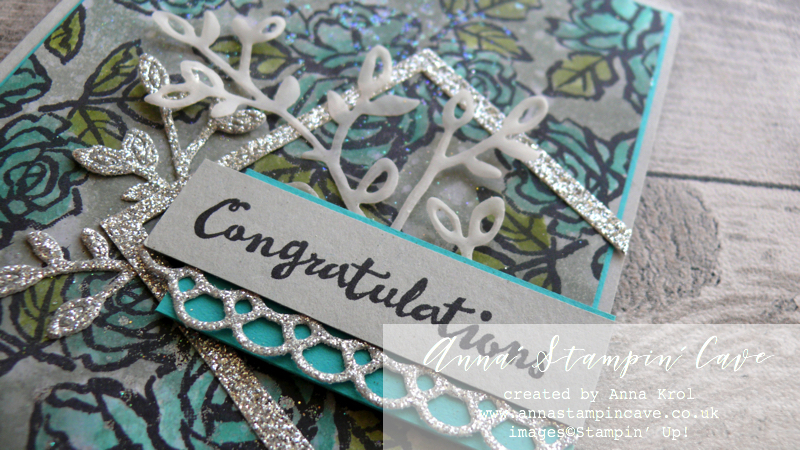 I also die cut a filigree banner from Silver Glimmer Paper. 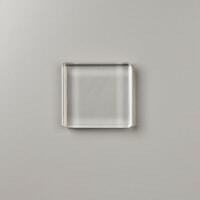 This square frame was actually a leftover from a different project (lying around) and it was just perfect fit. 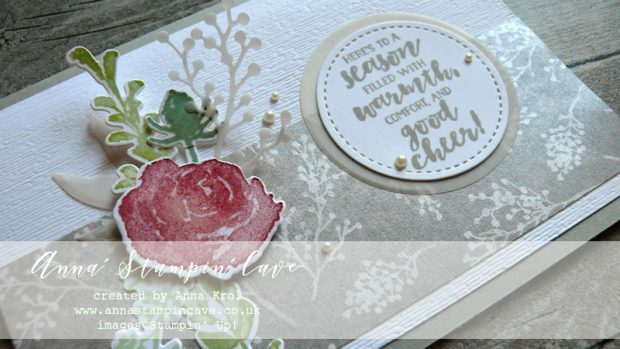 I played a bit with a placing of all my elements, and once I was happy I adhered them to the card. I am really chuffed how this card turned out. Such a shame it’s so hard to photograph and to show all the sparkle in the photo. But below you can see a ‘boomerang’ from my Instagram from when I created the background piece. The shimmer is just mesmerising!! So? Do like my card? I hope you do. Please let me know in the comments below. 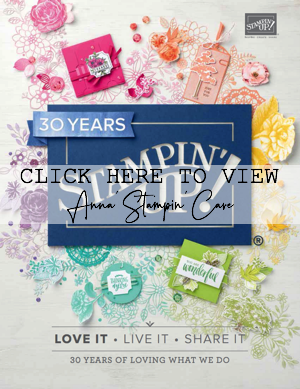 If you wish to purchase any of products I have used, simply click the images below to go directly to my online store and don’t forget to enter the hostess code CWKGWDD7 to receive a gift from me. 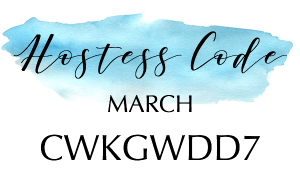 Hostess Code for a month of March: CWKGWDD7 – Use this code in the month of March and receive a gift from me. 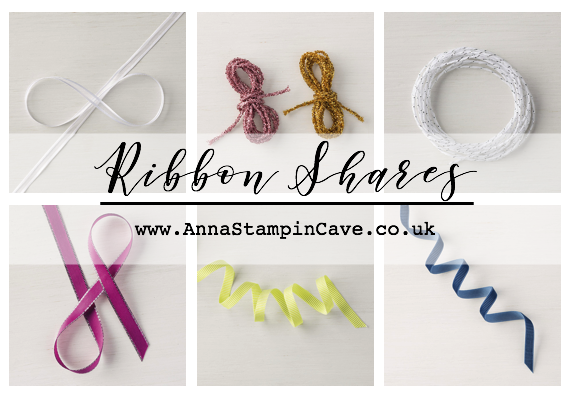 Spend £25 or more and use the code, and you will receive a Sweet Soiree Suite embellishments sample: one Silver Mini Gable Box + samples of ribbon and ‘shreddies’ (pink, silver or white) + a handmade gift from me. 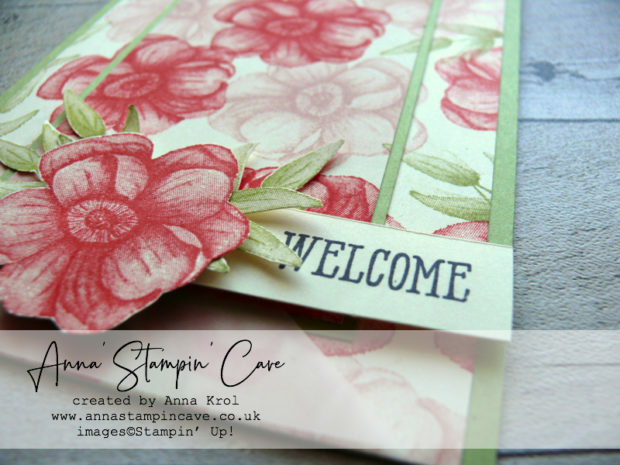 Hello and welcome to our very first For the Love of Creating with Stampin’ Up! 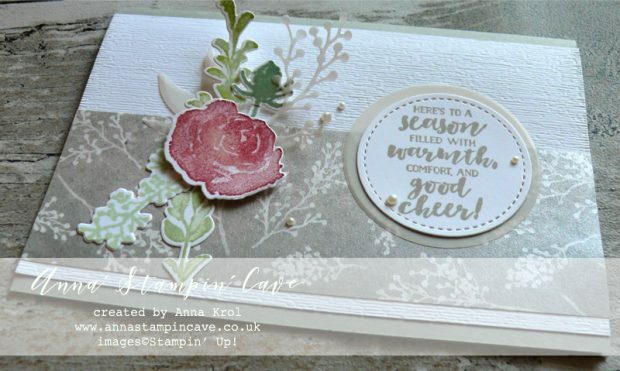 Blog Hop run by the amazing Australian demonstrator, Kim Oliver. 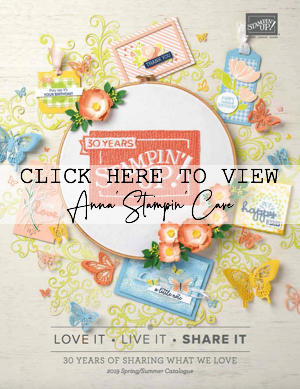 We are super excited to share with you an array of creations showcasing products from 2018 Occasions (Spring-Summer in the UK) catalogue and Sale-A-Bration freebies too. 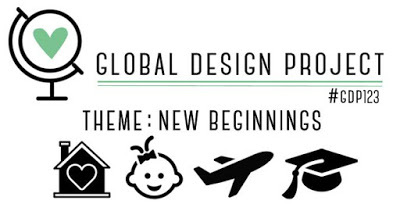 We hope you find great inspiration from our projects. If you have arrived here from Jay Soriano a big welcome to you. You are currently visiting Anna Krol from the United Kingdom. I really want to encourage you to hop along with us – you are in for a real treat, as we are demonstrators from all over the world. 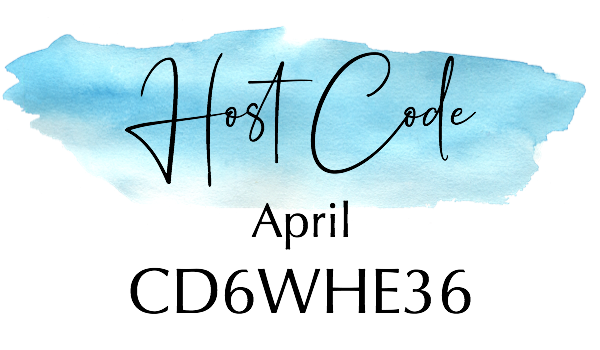 Below is a list of all designers, but you can also use the NEXT button further down to continue your journey on this blog hop. 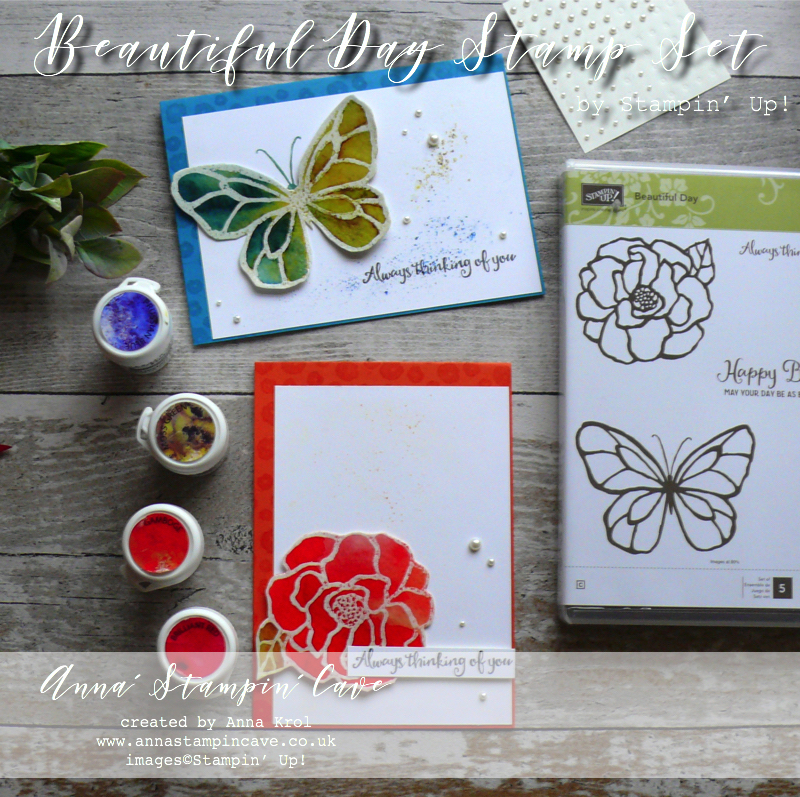 For my projects today I decided to showcase beautiful stamp set called (not mistakenly) Beautiful Day. 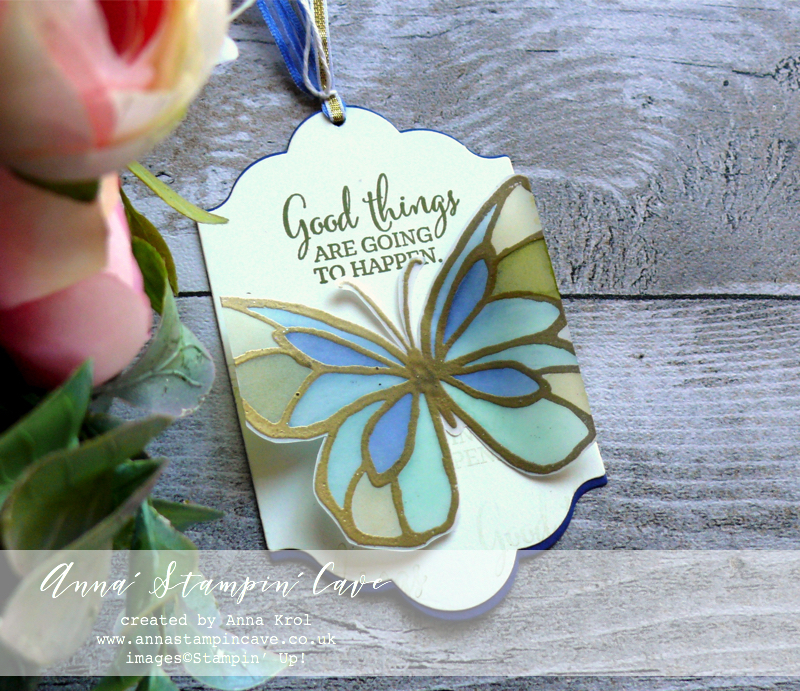 I will show you how to achieve stained glass effect using two different mediums. I love these bold images with its stained glass look – perfect for techniques and colouring. And that’s exactly what I did. 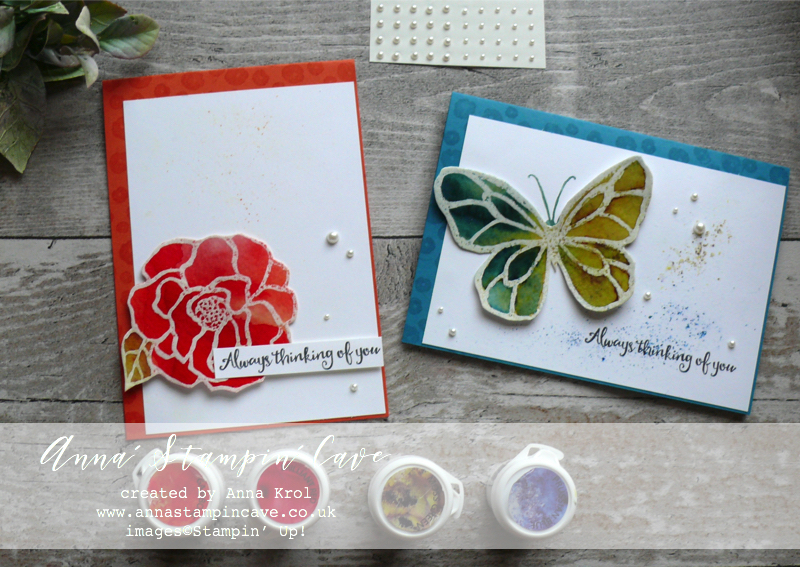 I stamped the flower and the butterfly on a piece of watercolour paper in Versamark and heat embossed them in white. Next, I filled them in with water and sprinkled Brusho Crystal Colour over the top. 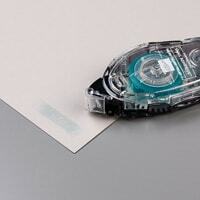 Heat embossing creates a barrier for the water and colour, so you can easily control how the colour spread. I’ve also used the aqua painter to move the colour around. For the flower, I’ve used Brilliant Red, Gamboge and Moss Green for the leaf. 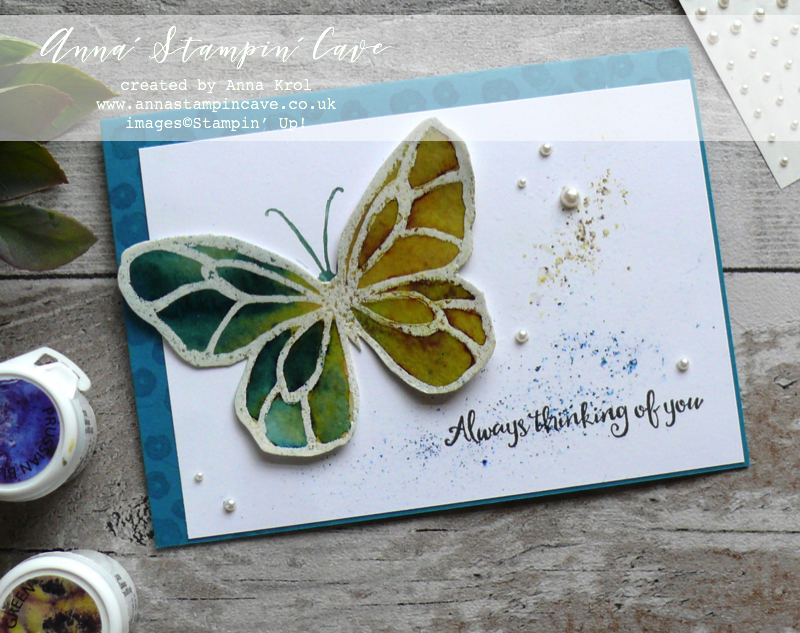 The butterfly is a mix of my favourite Prussian Blue and Moss Green. Once the flower and butterfly were dry I fussy cut them. To add that stained glass look, I smooshed Versamark on top of both images, sprinkled with clear embossing powder and heat set it. 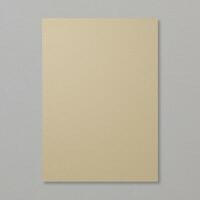 I love this rough texture of watercolour paper! I kept the rest of design very clean. 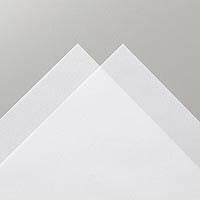 I sprinkled some brusho on Whisper White panels and spritzed with water (very, very lightly) before assembling my cards. 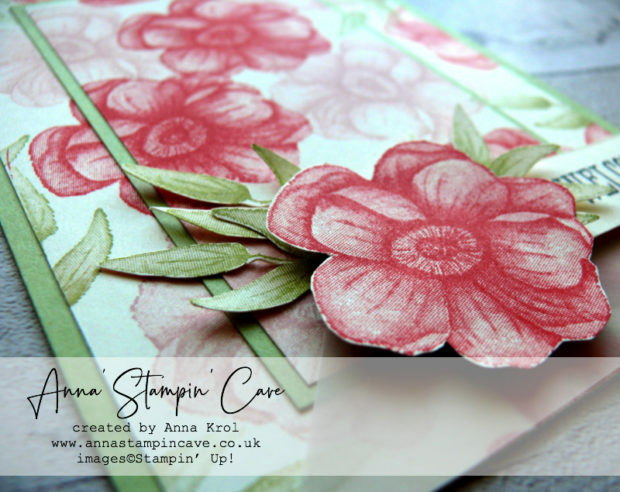 The edges of both card bases are stamped with three tiny flowers from the same stamp set, and I’ve used Versamark ink. 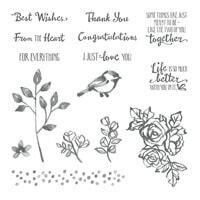 Sentiments are stamped in Archival Basic Black ink. Few pearls finish off the look. I love these vibrant colours. First, I stamped both images onto two pieces of vellum using Versamark ink and heat embossed them in gold. 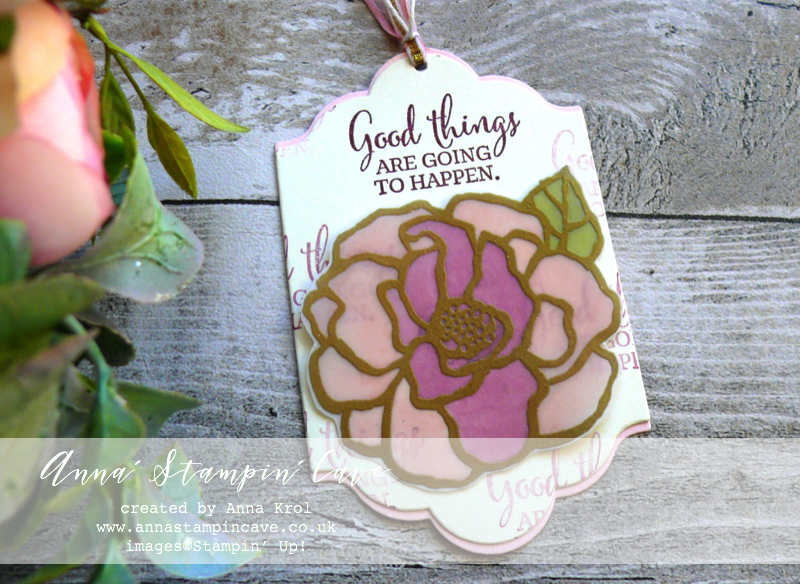 I even used Stampin’ Blends to dye Whisper White Organza Ribbon so it coordinates with my bookmarks – so much easier and quicker than using reinkers! I fussy cut my images. I die-cut four labels using Lots of Labels Framelits dies – two in Very Vanilla, one in Pink Pirouette and one in Night of Navy so they would coordinate with colours on the images. I die cut the Very Vanilla pieces slightly shorter. I stamped, repeatedly. 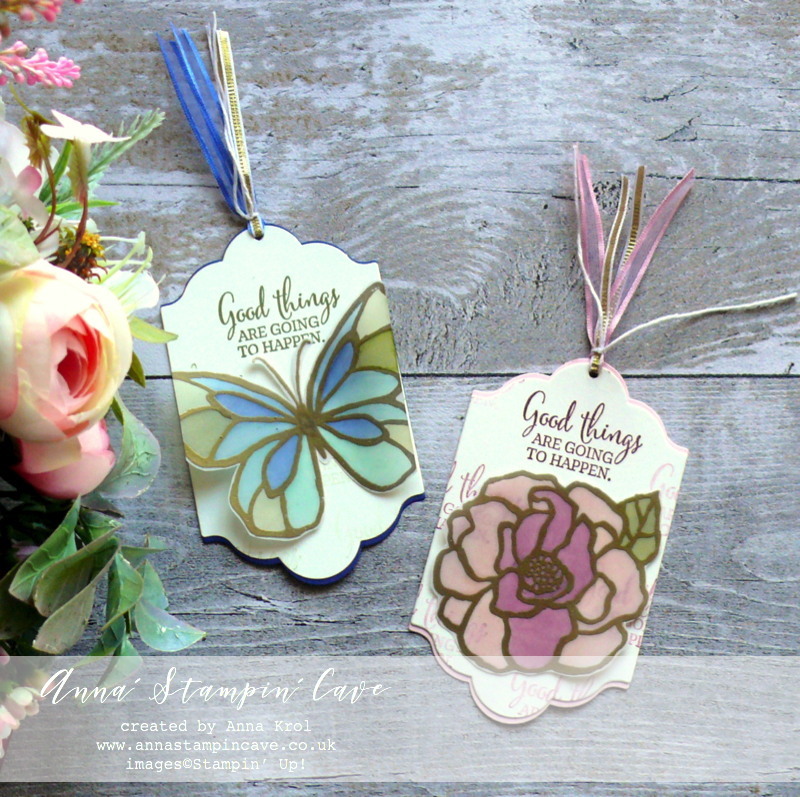 greeting from You’ve Got This Stamp Set (without re-inking) on my Very Vanilla pieces: For the butterfly bookmark using Old Olive ink pad; and for the flower bookmark in Rich Razzleberry. I assembled my bookmarks and adhered butterfly and the flower in the middle using Fast Fuse. Hope you like my little showcase and that you give the stained glass technique a go. Hostess Code for February: RRMR76JH – Use this code in the month of February and receive a gift from me. 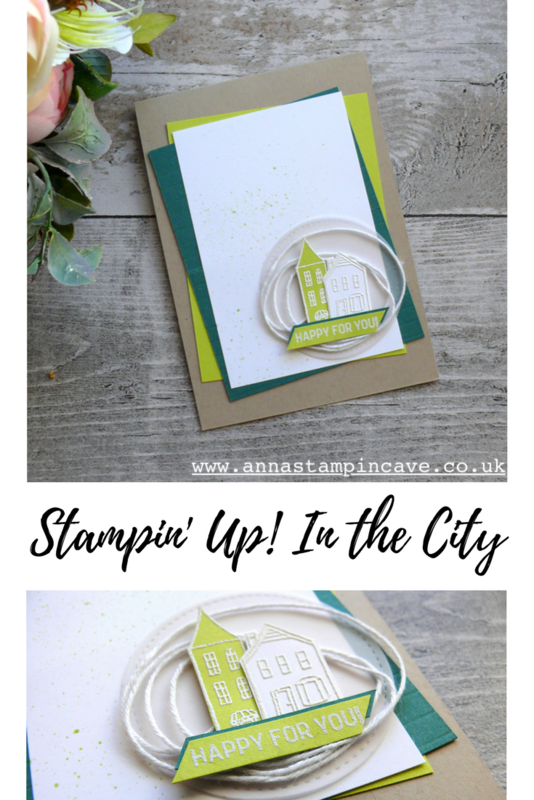 Anna’ Stampin’ Cave – Clean & Simple New Home card featuring ‘In The City’ Stamp Set from Stampin’ Up! Hello and welcome! 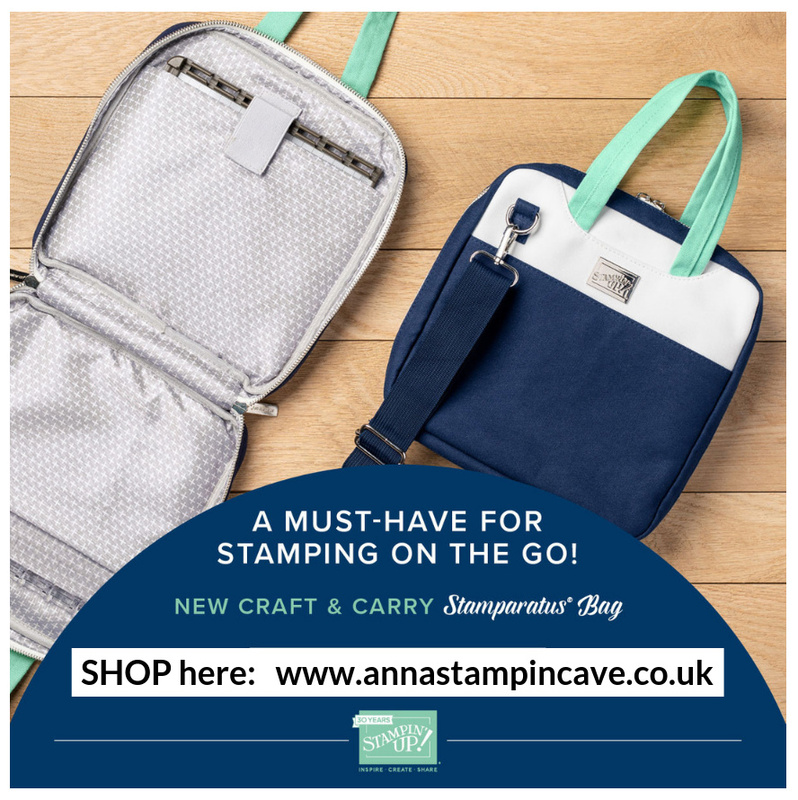 I’m so happy you popped in to visit my stampin’ cave. 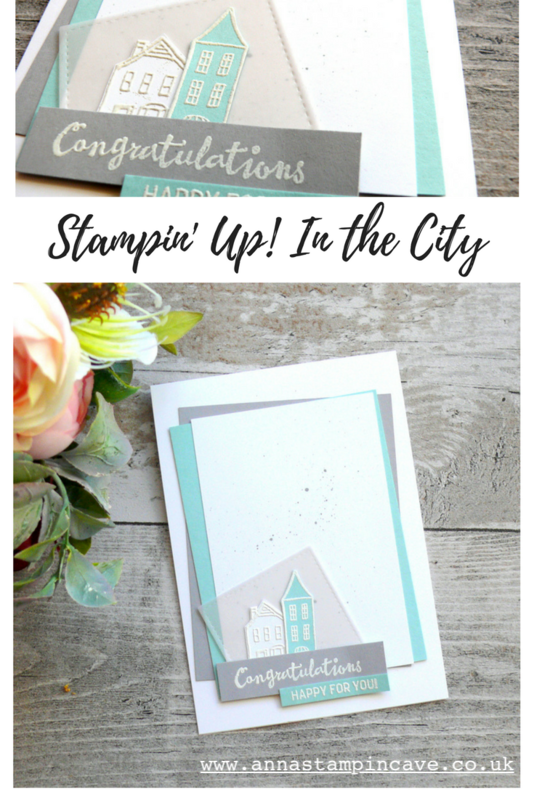 Today I’ve got for you beautiful, clean & simple cards using ‘In the City’ Stamp Set from Stampin’ Up! 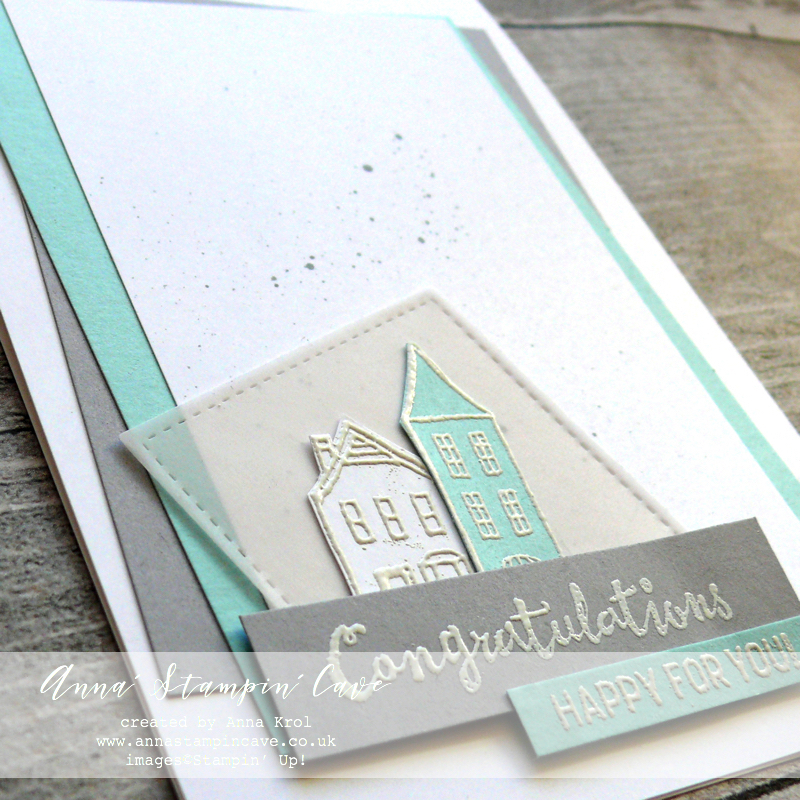 My hubby’s younger sister & her husband are in the middle of buying their first house, hence the theme of my cards. There are still few weeks, maybe even a month until the completion date, but we are so, SO happy for them! 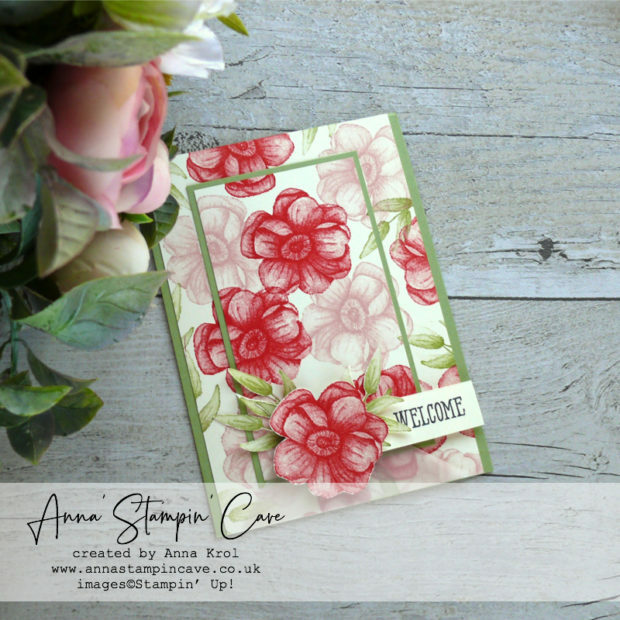 For this first card, I decided to use soft colours. Smoky Slate and Pool Party accompanied by Whisper White make such an elegant combination. First, I adhered all panels to the card base with snail adhesive. To add some interest to the layout, I assembled them at wonky angles. 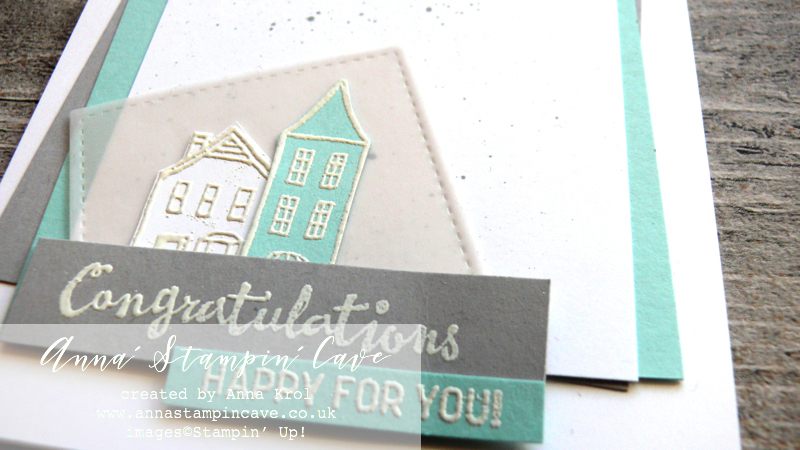 I stamped two tiny houses from In The City Stamp Set in Versamark ink; taller on a scrap of Pool Party cardstock, and lower one on Whisper White; and heat embossed them in white. 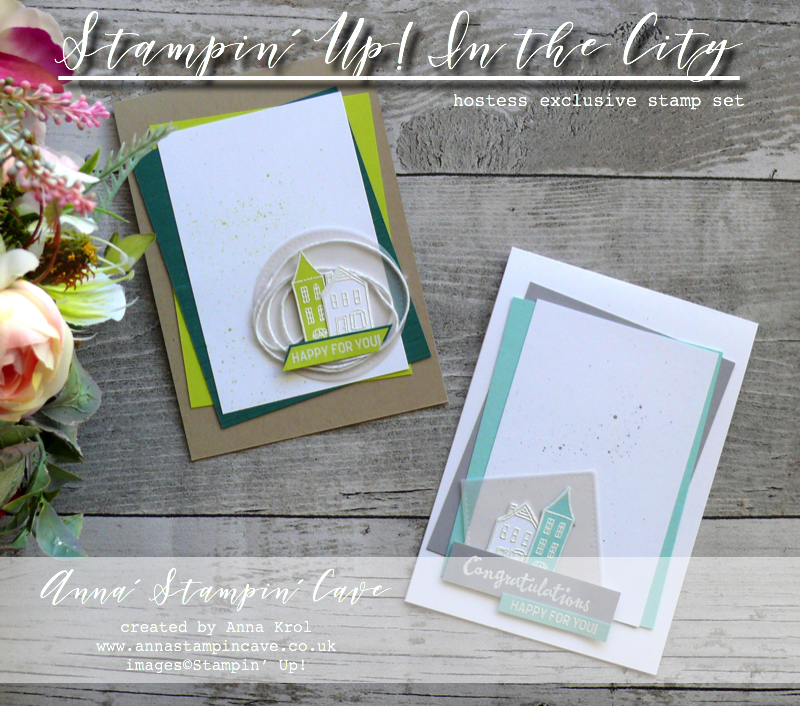 This set stamp set doesn’t come with coordinating dies, but images are so easy to fussy-cut I did it in no time. 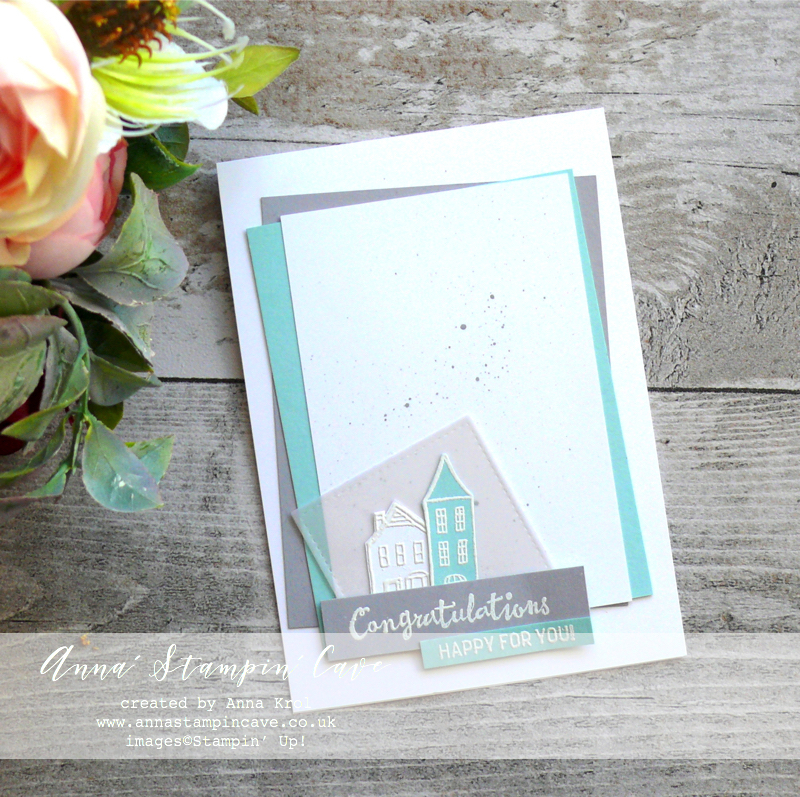 Sentiments are stamped in Versamark on two separate pieces of cardstock: I stamped ‘congratulations’ from Petal Palette Stamp Set on a strip of Smoky Slate cardstock, and ‘happy for you’ from In The City Stamp Set on a smaller strip of Pool Party and heat embossed both in white. I die-cut a square of vellum using 2nd largest square die from Stitched Shapes Thinlits Dies. While playing with placement, I thought it would look cool if the square was kinda wonky too (to echo panels) so once happy, I adhered my tiny houses briefly in the middle of that’ wonky’ square. Next, I adhered them to the card and added sentiments using dimensionals. 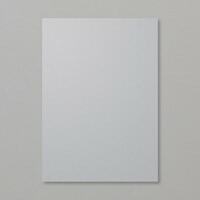 I know this card supposed to be CAS (clean & simple) but too much white hurts my eyes, honest haha. So before I finished assembling it, I took Smoky Slate ink pad and transferred some ink onto an acrylic block. 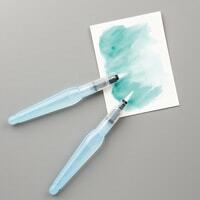 Next, using aqua painter I flicked few tiny ‘splatters’ of ink into the top Whisper White panel. For this second card, I decided to use brighter colours. I chose Tranquil Tide and Lemon Lime Twist for some fun pop of colour. The base is Crumb Cake. 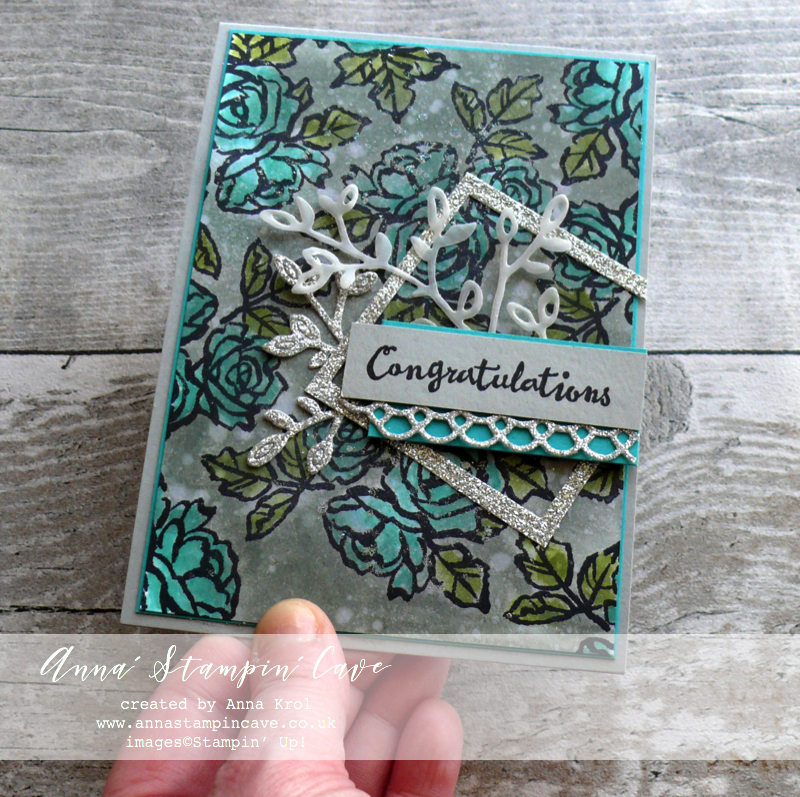 I wanted to add some extra texture and interest to this card. 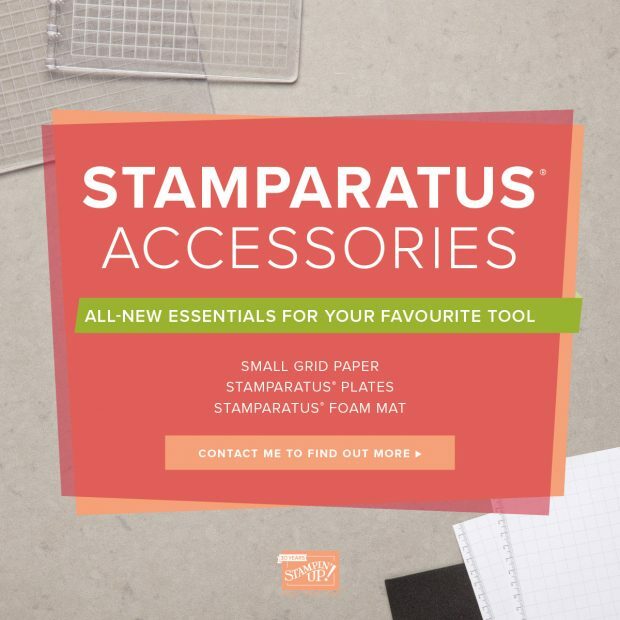 I really like the Simply Stripes Textured Embossing Folder from Spring Summer catalogue. But because I don’t have it yet I decided to imitate the look. 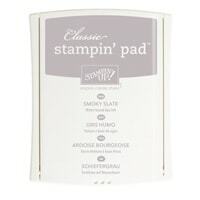 I took my Tranquil Tide panel and with a help of Stampin’ Trimmer, I scored it every 1/4″. I love how it looks. 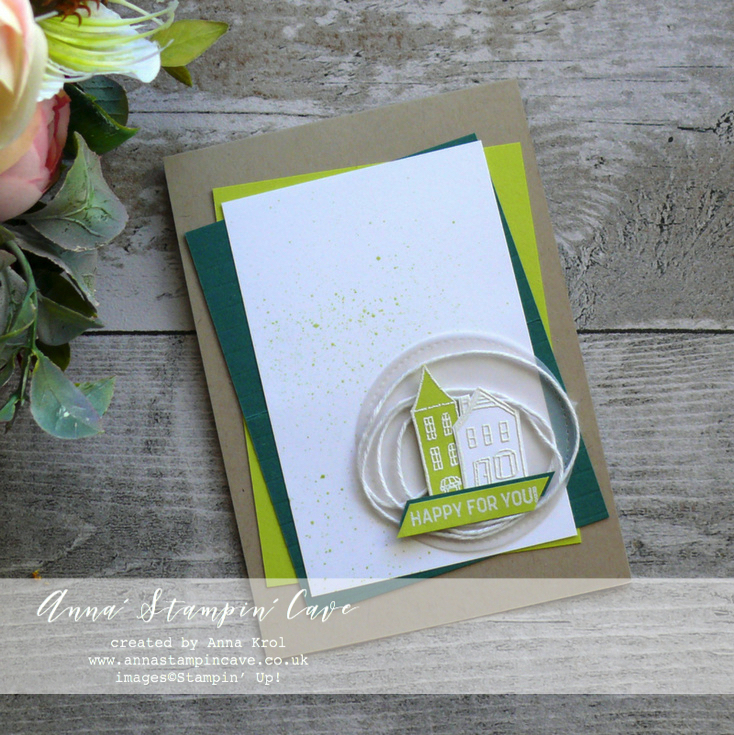 I also added Lemon Lime Twist splatters to Whisper White panel and adhered all the layers to the card base. To soften up wonky angles I die-cut a circle from vellum using the 2nd largest circle from Stitched Shapes Framelits Dies. I wrapped some Whisper White Baker’s Twine around my fingers to create ‘wreath-like’ shape, and add it in the centre of the vellum circle with a dab of glue (snail adhesive). I took tiny buildings and simple sentiment strip, put dimensionals to the back and mounted them onto my circle. 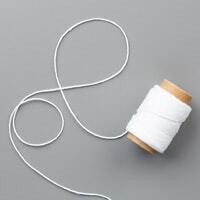 Dimensionals not just keep all elements together, but they also secure twine from slipping off. I adhered my circle to the card with snail adhesive. I love how these cards turned out. 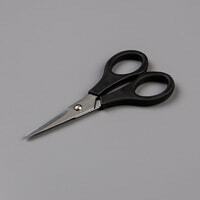 And to be honest, with a little tweak, they could easily fit any occasion really. 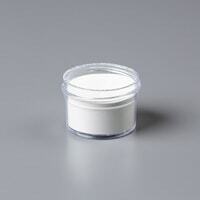 If you wish to purchase any of products I have used, simply click the images below to go directly to my online store and don’t forget to enter the hostess code RRMR76JH to receive a gift from me. 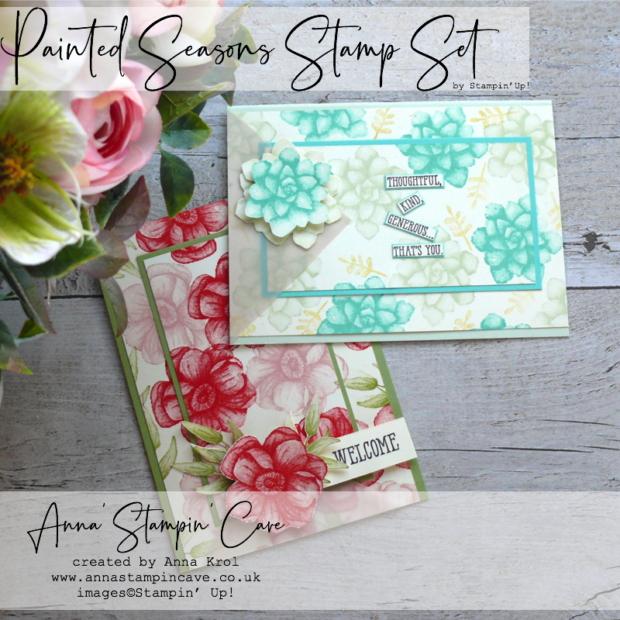 Just a reminder that In The City Stamp Set is an exclusive Hostess Set, which means you can’t buy it, you can only earn it (choose) free when you spend £150 or more in my online store.